The Sahara sand seems to be just about left behind, which means more water and perhaps fish, but also more people. 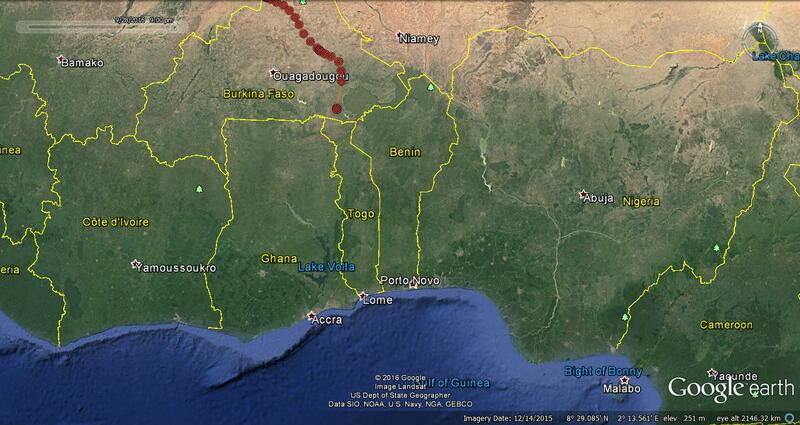 Map above 26th Sept. Map below 29th September. Is he still on course for Bioko? Two downloads to look at. One for Bega and one for No 14. In comparison they are of great interest as they show the huge area that our UK birds cover in their migrations. 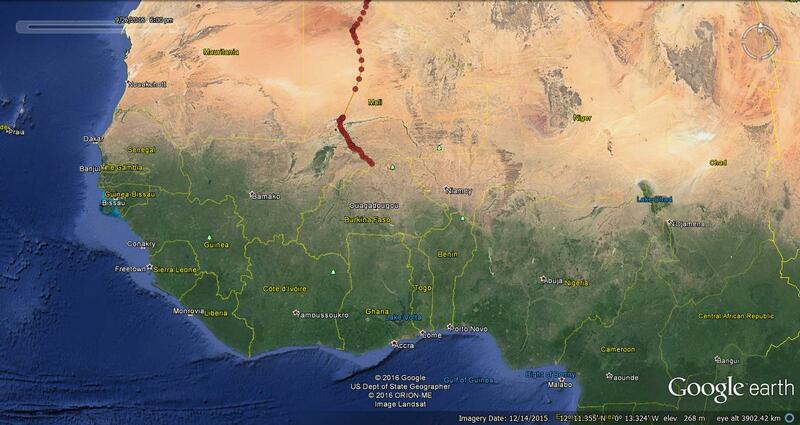 Number 14 is in Mali, the very centre of the Sahara on his way back to Bioko. 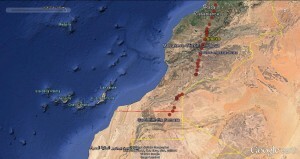 Bega has just crossed the Atlas mountains and seems to be on her way to Senegal area.. Both Bega and her brother No 14 are now in the air. Bega crossed the channel, and left the Normandy coastline on the 14th then headed for Bordeaux and at the last download was at Poitou- Charentes. 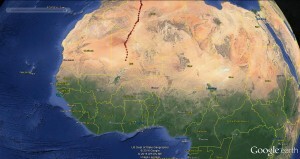 This area is renowned for the migratory movements of its people, as it is the region of origin of most of the Arcadian and Cajun populations of Canada, where of course the N American osprey populations are just starting to move on their journeys to Central and South America. Number 14 is on his third trip south. Left Cumbria at 10.00 Thursday and then motored to Garstang 11.00, West Birmingham 1400 and the last signal Marlborough, Wiltshire 1600, heading for New Forest area. Sometimes we see transport planes flying ponderously down Bassenthwaite Lake. and sometimes we hear jets cracking the sound barrier. 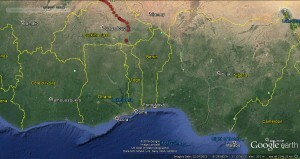 Bega seems to be modelling herself on the former as she toddles down England. 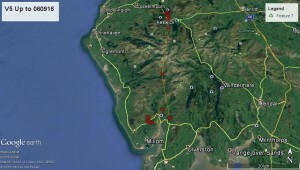 Weds 7th 12.00 – 13.00 crossed Morecambe bay. Over Manchester Thursday lunchtime. Saturday 10th 18.00 at Barton in the Beans (would you believe) West of Leicester. Yesterday morning just North west of Winchester. and at 18.00 yesterday night was near the M3, north of Southhampton the Otterburn, Cranbury park area. Will she flap over to France? No 14 still in South Lakes. The Apron strings, or maybe the Braces, have broken. Bega is flying free if not too wild. 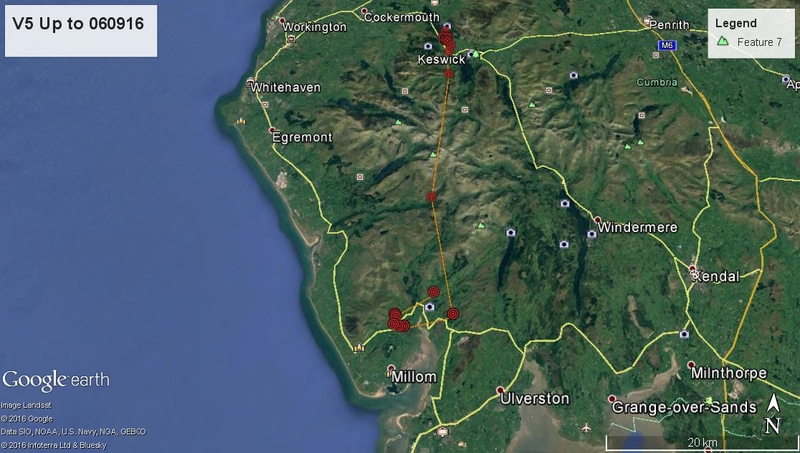 On Saturday 3rd Bega (and No 14) were still in their usual summer grounds, but on Sunday 1st Bega started moving down the country, not in the usual focussed flight we have seen in many of our other birds, that eats up the miles in one burst to get them well away from home, but in a sort of meander that took her near to Fowlshaw. On Tuesday 6th she was still in that area, although it does not look like she has come across No 14. Although this pattern of behaviour is slightly different, it may be the right thing for Bega. Whilst manning the viewpoints up to August 29th, no-one actually saw Bega catch a fish, so the rich area of sandy shallow estuary and flats of South Lakes would be a good place to linger in and begin to take your fishing career more seriously.